If you’re concerned about hair loss and thinning hair, we know you have questions. At RHRLI we’re used to hearing lots of questions. We hear them every day, and we’re happy to hear your questions because we want you to know all of the facts about hair loss and treatment. The first step in treating any of our patients is always a consultation. We are the only hair loss treatment center on Long Island to offer the ARTAS® Robotic Hair Transplant System, a state-of-the-art hair transplant procedure which is the best solution for thinning hair. We always want to explain to our patients how this cutting edge technology can help them and ease their concerns about hair loss treatment. 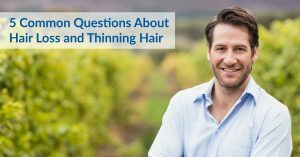 We get many questions about hair loss and thinning hair during our consultations, so we thought we’d share 5 common questions and answers that come up. Question 1: What Causes Hair Loss? There are many causes behind hair loss, according to the International Society of Hair Restoration Surgery. It can be caused by illness, such as thyroid conditions and anemia. Cancer medications such as those associated with chemotherapy can also cause hair loss as can things like stress, injury and scarring to the scalp or even things like exposure to chemicals. But the most common form of hair loss is called androgenetic alopecia, more commonly known as male or female pattern hair loss. Question 2: What is Male or Female Pattern Hair Loss? Androgenetic alopecia is responsible for the vast majority of hair loss in men, according to the American Hair Loss Association (AHLA), It’s also a major cause of hair loss in women. While women with androgenetic alopecia have different patterns of hair loss, men have a more distinct pattern which eventually progresses to the entire scalp. The condition is caused by a genetic sensitivity to dihydrotestosterone (DHT). That sensitivity causes hair follicles to miniaturize which shortens the lifespan of the hair follicle. Question 3: Is There a Permanent Solution to Hair Loss or Thinning Hair? Some conditions are only temporary, but most are not. Hair loss medications that are currently on the market will not help if you stop using them. That leaves a hair transplant procedure as the only viable permanent solution. At RHRLI, our procedure, the ARTAS® system uses precision robotic technology to find healthy donor hairs and transfer them to where they’re needed. The result will be a natural, healthy looking head of hair. Question 4: Does the ARTAS® Procedure Hurt? Not really. ARTAS® is a Follicular Unit Extraction (FUE) procedure which is minimally invasive. Unlike other procedures such as Follicular Unit Transplantation (FUT), also called strip surgery, there’s no need for scalpels or stitches with ARTAS®. There is minimal scarring after surgery and most of our patients report that they feel little or no pain during the procedure. Watch this video that features a few of our past clients and their comments about the ARTAS® system. Question 5: How Long Is the Recovery Time? You can expect a quick recovery time. Because ARTAS® is minimally invasive, you won’t have to worry about removing stitches. You’ll only feel minor swelling or discomfort and some patients don’t even require pain medication following the procedure. Most patients will go back to regular activity within a few days. RHRLI understands that you have concerns about hair loss and thinning hair and we want our patients to have as much information as possible about their condition and to understand why the ARTAS® System is the best option for you. We’re always available to answer your questions. To schedule a consultation, contact RHRLI today. Previous Post: « What is Scalp Micropigmentation?